Easy to find, we are located a quick 3.5 miles off I24 on US 41, atop the Magnificent Cumberland plateau part of the Appalachian mountains, between Nashville & Chattanooga Tennessee. Take exit 135 towards Tracy City. Proceed 3.5 miles to gallery on the left. 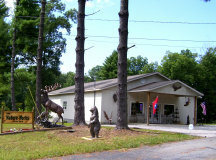 Where is The Nature works & North By Nature Gallery located? Our 100% Money back guarantee applies to all merchandise we sell. Simply contact us prior to returning the merchandise so we can assign an authorization number. Items returned without an authorization number will be subject to a restocking fee of 25%. We will gladly refund your money* (Less a 15% restocking fee*) if you are not satisfied for any reason provided the merchandise is returned to us unused and in good condition within 30 days from the date of purchase. Items must be returned in original packaging and packed to prevent damage during return shipping. Buyer is responsible for purchasing the required shipping insurance and for the return shipping charges. <?xml:namespace prefix = "o" ns = "urn:schemas-microsoft-com:office:office" />*some exceptions do apply. T-shirts cannot be returned as these items are special order. Our Guarantee to you: We will never sell, trade, or barter your email, phone number, customer information or any purchase information. Ever. Period! Learn more about Tennessee Here. We guarantee all of your transactions to be safe. For your Credit Card Payments, we use PayPal the world's largest online payment service. PayPal uses SSL technology to keep your information safe. In addition, when you send a payment using PayPal, we won't receive sensitive financial information like your credit card or bank account number. We watch our competitors prices so you don't have to, but in the unlikely event that you should happen to find an item advertised at a lower price, simply email us with the Competitors item details, and we will beat the competitions price - Guaranteed! While most in stock items ship within 48 hours excluding weekends and holidays, some items will Ship Within 2 to 4 weeks. If there is a delay for any reason we will e-mail you, or call you. Cancelled orders may be subject to a restocking fee of 15%.